I did take some time to take pictures of all my WIPs yesterday and get them uploaded since I hadn’t photographed almost any in-progress pics of them yet. Here’s everything I’ve got on the needles right now. Just before leaving to DC, I had a sudden moment of “omg must cast on something new for the trip! 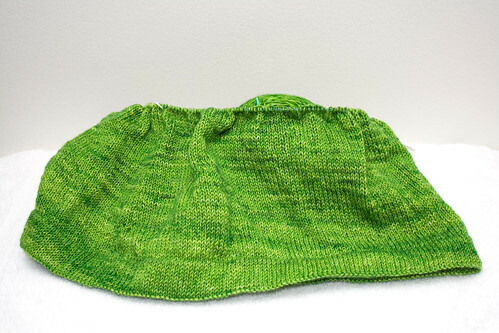 !” Suddenly the thought of all the stockinette and garter stitch projects I have going made me feel like I’d be totally bored with them and that I needed something more interesting to work on. I quickly looked through my stash, picked a pattern, and cast these on while Matt drove me to the airport. 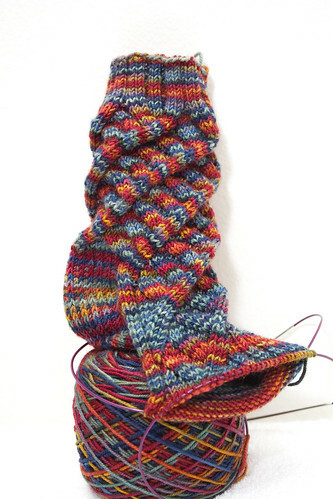 The yarn in Blue Moon Fiber Arts Socks That Rock Mediumweight in the Farmhouse colorway and the pattern is Maelstrom. 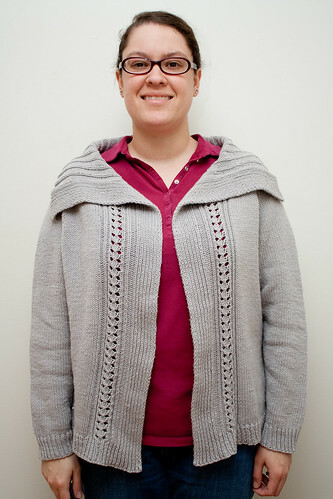 I have knit this pattern before and found it to be quite enjoyable. Just enough patterning to keep it interesting and keep me from getting bored with it. I was able to get the first sock to where all the gusset decreases have been done. I only knit on this at the airport waiting for my flight to DC, on the plane to DC, on the bus to the hotel, on the bus back to the airport, at the airport waiting for my flight home, and on the plane home (and while stuck on the runway for about 45 mins). The rest of the time while taking the Metro pretty much everywhere I went, I brought my Perfect Day Yarns stripey sock with me to knit. 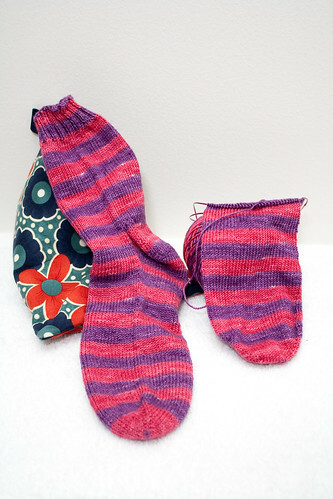 I managed to get the first stripey sock done and get up to where I start the gusset increases on the second one! For some reason these socks seem to be taking me a long time and for no good reason other then they keep getting put on the back burner so I can work on other things. I love the yarn and the colors, so once I finish Elektra, I think I’ll focus on finishing these. 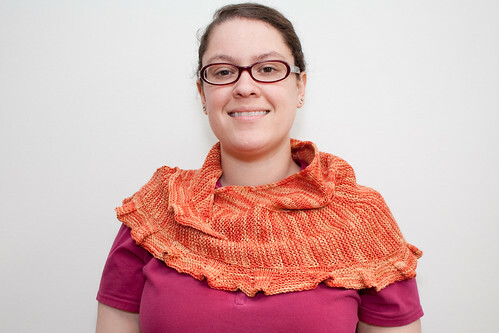 I did try a new-to-me cast off on these: Jeny’s Surprisingly Stretchy Bind Off. I think it’s my new favorite! It is, like it’s called, surprisingly stretchy. 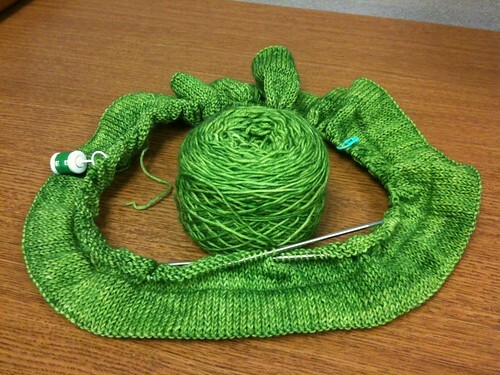 I like the way it looks and it’s a lot easier then the typical sewn in bind off I have done. Definitely my new go-to for toe-up socks. Last post I mentioned that I was waiting for the beads to arrive so I could cast on Elektra. They on April 7th and I cast on for it right away. 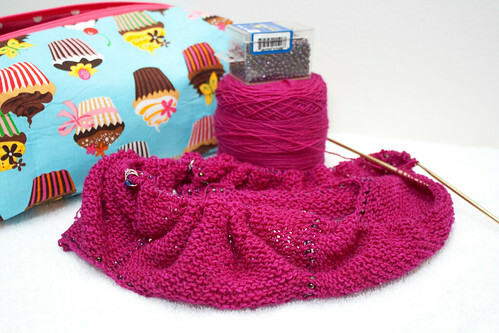 Yesterday I was 4 rows from finishing Section B when I realized I did two bead rows in a row, skipping an increase row. I had to frog 18 rows, 9 of which had beads. I’ve knit about half of those rows over again and I’m hoping to finish Section B today. I’ve got a week and a half to get it done and blocked. Hopefully I can get it done. Last post I also mentioned starting Rook. I did finish the first one, though it’s not finished in this photo. Slipped Hours has seen a fair amount of progress, especially this weekend while we were at a Cincinnati Reds game. 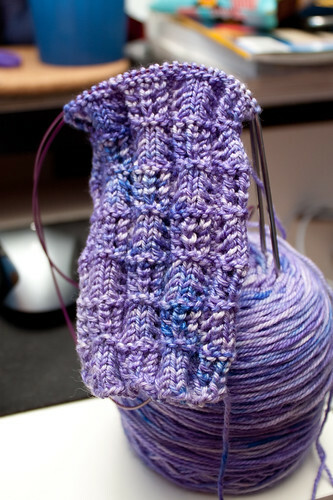 I’m up to where I’m increasing from the waist shaping and on to the second skein of yarn. Not super interesting to look at right now, but it’s growing pretty quickly. Since I’m focusing all my knitting energy on Elektra, I’ve set this (and all other projects) to the side until it’s done. Even with all these projects in the works and knowing I should focus on getting Elektra done, all I want to do is cast on more things! It sure didn’t help that I recently went through my queue to clear out things I’ll never knit, no longer interested in, or can’t remember why I even queued it in the first place. I came across so many things that made me go “… and I want to knit that and that and that… and OH THAT!” I’ve even got two projects set up on Ravelry for the next sweater and shawl I want to cast on. 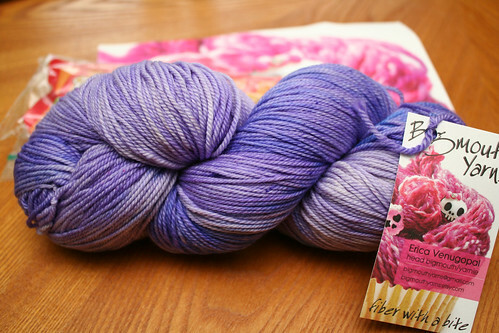 I saw Shibuya at Fibre Space (which you can get to pretty easily on the metro – only a few blocks to walk from the metro station to the shop) where they have a sample of it knit up in Berroco Vintage DK. I saw it and immediately fell in love with it. I needed to make one for myself! I bought the book, yarn, and needles for it on the spot. Normally I wouldn’t buy needles because I have a pretty big collection of them, but it seems that I only own one US 5 needle that is always in use, so I figured it wouldn’t hurt to have another and it meant I could swatch for it right away. At any rate, I’m itching to cast this on! Trying to hold out until I’ve got some other things (like Slipped Hours) off the needles first. The other project I want to start soon is Rock Island. 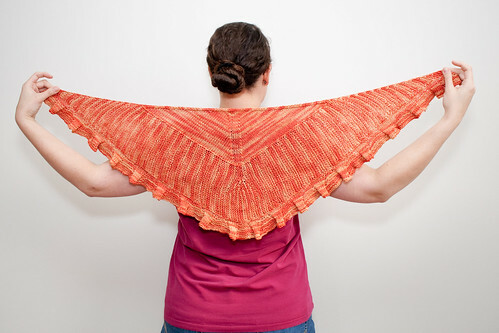 I’ve had this SweetGeorgia Yarns CashSilk Lace in my stash for a while and had it set aside for another shawl. 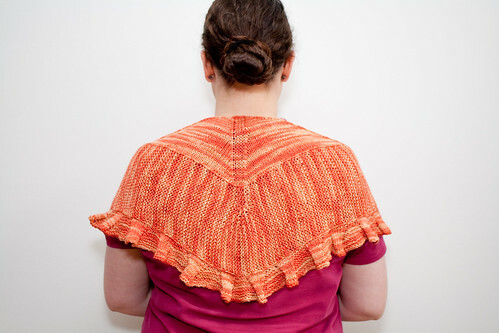 I hadn’t cast on for the intended shawl because I really needed 1000 yards and I only had 800 yards. I was planning on just making it shorter then called for, but after a lot of debate, I knew I wanted to knit the whole thing, so this was waiting for the right project to come along. Well, it has! I love a lot of Jared Flood’s patterns and this is no exception. Once I get Elektra finished, I’ll be casting this on right away.